What does it all mean? What are they really trying to say? What’s being subverted/deconstructed here? I spent far too much time exploring those questions while taking in Netflix’s Joel & Ethan Coen anthology western The Ballad of Buster Scruggs, whose six chapters are framed as coming out of an old storybook. Famously misreported as being designed as an anthology TV series, the Coens recently set the record straight in a Empire magazine interview: this is and was always meant to be a movie, and apart from one chapter adapted from a Jack London story it’s mostly a collection of their spare ideas from prior projects or simply western scenarios they’ve always wanted to tackle. Indeed, it’s not hard to imagine the gang from True Grit encountering one of these stories during their journey. Still, I persisted in trying to treat Buster as grand cinema, a work with themes undoubtedly as rich as the colors in Bruno Delbonnel’s breathtaking cinematography. That’s what we’re all supposed to do with any Coen Brothers project, even if this one is playing on Netflix and not in theaters (outside of LA and NY, at least). The mercurial minds behind Fargo and No Country for Old Men demand nothing less and by opening Ballad with a wide vista of Monument Valley, home to so many classic westerns, they are clearly inviting us to draw cinematic comparisons and search for larger meaning. So, surely the fact that two of the first three chapters revolve around the passing of a guard and transference of high to low art has to reflect some kind of late-career frustration on the Coens’ part. Right? For example, Tim Blake Nelson’s shockingly violent version of a Roy Rogers singing cowboy in the titular “Ballad” is wanted not for murder but for being a “Misanthrope” (obvious in-joke). He ultimately comes face to face with his replacement because in the Old West there’s always someone younger, faster, and better, even if your schtick is that you’re a singing cowboy who can shoot or talk your way out of any situation. In “Meal Ticket,” Liam Neeson’s freak show impresario watches as the crowds dwindle for his main attraction, an armless, legless man (Harry Potter’s Harry Shelling) who recites Shakespeare and Shelley. So, he searches for his next gimmick, unsure what he’ll do with the stump of a man he used to call his meal ticket once he finds it. It’s easy to see Neeson as a stand-in for any number of movie producers who have moved on from the Coens in response to yet another box office disappointment, particularly as of late since Inside Llewyn Davis, Hail, Caesar!, and now Buster Scruggs all feature entirely different producers. Nelson’s cowboy, meanwhile, is a symbol of a beloved childhood idol – this is, after all, the second film in a row for the Coens to feature a singing cowboy – torn asunder by the inevitable march of time, reflective of the Brothers perhaps sensing their mortality and never-ending competition from the latest new generation of filmmakers (look at the pure genius Noah Hawley has brought to the Fargo TV series). But, if the inevitability of transition is the throughline then why don’t those themes pop up as obviously in the other chapters? Why is “Near Algodones,” the James Franco-starring second chapter in which both a bank robbery and subsequent hanging go horribly wrong, mostly just an excuse for a killer final line/joke? 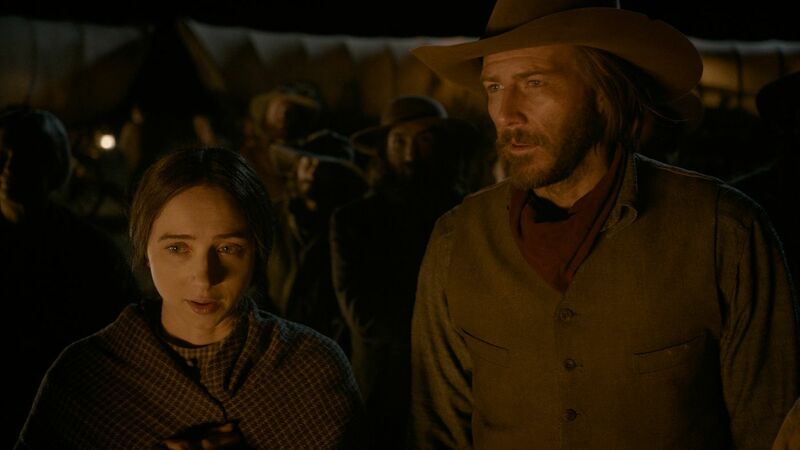 Ditto for “The Gal Who Got Rattled,” the longest and most emotionally affecting of the chapters, chronicling a surprisingly tender love story (between Zoe Kazan and Bill Heck) born on the Oregon Trail. Eventually, though, I just let all of that go. Not even consciously. Without even meaning to, I stopped analyzing and started purely enjoying Ballad of Buster Scruggs, more so than I have with any Coen Brothers movie in quite a while. It happened several minutes into the fourth chapter, “All Gold Canyon,” the Jack London adaptation starring Tom Waits as an ever patient prospector in the Colorado mountains. Filmed hours outside of Telluride, the simple tale of man’s corruption of nature, bringing greed and violence to a valley so beautiful and untouched by human hands it might as well be called heaven sucked me in completely. Once “The Gal Who Got Rattled” followed I started to wish the Coens had actually made this as an anthology series, not a movie. The hook is actually quite obvious: Twilight Zone: The Western. Or, if you prefer a more modern variation, Black Mirror: The Western. Each story builds to a wicked twist ending, but because this is the Coen Brothers we’re talking about here the endings are all black comedy perfection. Given that consistent story structure, the Coens are free to treat each episode as a tweak on their favorite kinds of westerns. There’s a violent Roy Rogers (“Ballad”), a spaghetti western comedy (“Algodones”), a bleak McCabe & Mrs. Miller anti-western (“Meal Ticket”), a Stagecoach without the actual Native American attack (“The Mortal Remains,” the final and least effective chapter of the film) and so on. I could watch them do 6 more chapters of this and be happy, particularly with the clearly sizable budget they’ve been handed by Annapurna Television and Netflix to paint their enticing western tableaus. Why not keep this going? “You’d think that – they’re all self-contained stories – but all our movies you go, ‘We did it. So we’re not going to it again,’” Ethan told Empire. For western lovers, it’s well worth taking a break from your latest round of Red Dead Redemption 2 to give Ballad of Buster Scruggs a look. For Coen Brothers fans, prepare for one of the more effortlessly entertaining works in their filmography. It’s a kind of Coens sampler, lighter on challenging themes, higher on clever turns of cruel fate, and overflowing in gorgeous imagery. That Monument Valley opening I mentioned earlier? Not actually Monument Valley. They filmed in New Mexico and digitally inserted the Monument Valley scenery behind Nelson. One benefit of Buster Scruggs being on Netflix and not in theaters is you can pause to read each storybook page which shows up on screen in-between chapters. The page which closes out “The Gal Who Got Rattled” is a particular must-read. Am I way off? Was I wrong to ever search for autobiography in a Coen Brothers movie? Is this less about them, more about simply deconstructing the western? What’s your take on Buster Scruggs? Let me know in the comments.